“We know that in everything God works for good, with those who love Him, who are called according to His purpose. that he might be the first-born among many brethren. Even the name she was given came directly from Heaven. Originally she was named Isabel after her maternal grandmother. But a miraculous occurrence took place while the child was an infant, before her Baptism. She was in her stroller with the Indian servant Mariana. All of a sudden the maid began to cry out to Rose’s mother and the children assembled in the room. She saw the child’s face turn into a beautiful rose! The children ran over to the stroller. They saw something different. They cried out that they saw a rose above her head, suspended in mid-air. Her mother, Oliva, took this as a sign from Heaven that the child was to be named Rose. We believe it was a sign from Heaven also, even though it caused a lifetime of bad feelings between Oliva and her mother, Isabel, for reasons which are pretty obvious. 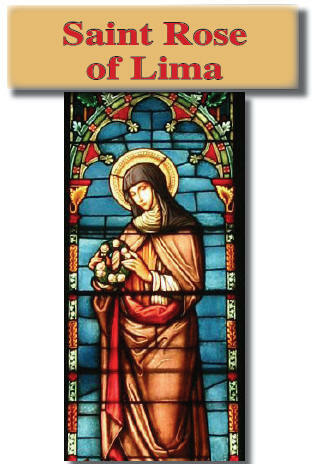 This was just the beginning of the mystical experiences attributed to St. Rose of Lima. When it was time for the Baptism, Rose’s grandmother, Isabel was still determined to have the Archbishop, Toribio de Mongrevo, baptize the child with her given name, Isabel. But the Archbishop, who heard about this miracle from his sister, being justifiably fascinated by the possibility that this might truly be a miracle from Heaven, baptized her with the name Rose, ignoring the name Isabel altogether. Whether he did it intentionally, or was inspired by the Holy Spirit, is not certain. Do you think there may have been a little intercession from on high? We do. We believe that God had a very special plan for this child in the religious development of the people of this New World. If we just look at the parallel world, Europe, in this same time frame, we may be given some indicator as to why God was working so hard to make the Church strong in Peru. The year of Rose’s birth was 1586. What was happening in Europe in 1586? The heresies of Martin Luther had wreaked havoc on the Church of Europe from the beginning of the century. But the movement faltered, even under the rule of Calvin, who was much more violent than Martin Luther. It was in great danger of collapsing, until Henry VIII of England started his own church in an effort to legitimize his lustful and adulterous behavior. He wanted to marry many women and couldn’t get the Pope to annul his previous marriages. Henry decided to throw out the Catholic Church and start a new church, with him as the head. This from a man who had been given the title of Defender of the Faith by the Pope for his defense of the Faith against Martin Luther. Henry VIII’s daughters played a game of one upmanship on him, treating those who would not come over to the Church of England worse than Henry did. By 1570, Elizabeth I, his daughter from Ann Boleyn, declared her Act of Supremacy,1 and in 1585, it became illegal to be a priest in England under pain of treason. Priests and religious became non-persons. This was Elizabeth’s way of getting back at Pope Pius V, who excommunicated her as a heretic in 1570. In 1588, a rumor was started that the Pope and the King of Spain were planning an invasion on England and Ireland. All priests who were in captivity or who were able to be rounded up, were taken to Canterbury and executed. Most were hanged, then drawn and quartered.2 They were called the Martyrs of Canterbury. During the time Elizabeth and her cronies were enjoying killing their own countrymen, she decided it was time to subject the Irish to her particular type of terror. Thus began the Penal times for the Irish, the age of the persecution. Thousands of Irish people, faithful to the Church, were slaughtered or starved to death in an effort to bring Ireland under English Rule and the Church of England. It never happened. This was followed by Oliver Cromwell, who subjected the Irish to inhuman terror. In France, the Huguenots3 began Wars of Religion, in which they looted and destroyed churches, kidnapped and murdered priests and nuns, dug up bodies of Saints and profaned them, all to put down Catholicism in France. So if you wonder why Our Lady came to Guadalupe in 1531, and Our Lord Jesus gave us Martin de Porres, Rose of Lima, and Toribio de Mongrevo in Lima Peru at the end of the Sixteenth century, the answer may be all too clear. In the midst of so much political activity in Lima, little Rose was born on April 20, 1586 to Oliva and Gaspar Flores. From the very beginning of her life she exhibited a great deal of mysticism. She was the only child of Gaspar and Oliva’s eleven children who did not cause her mother any labor pains. All the children before, and those subsequent to Rose, caused her a great deal of pain in child-bearing. Rose, on the other hand, caused her mother a great deal of pain after she was born. She was the recipient of God’s graces from an early age. Barely able to walk, she would be found lost in contemplation before the big crucifix in her mother’s room. At three years old, she endured surgery from an accident without crying at all. A heavy lid from a flour jar fell on her finger, causing a blood clot and great pain. The surgeon had to cut back her fingernail, and apply acid to the finger. All of this was done without anesthetic. The acid had to stay on the finger for several days. When she was complimented on her behavior, Rose commented on how much more Jesus had suffered. During Rose’s recuperation period from the blood clot, her mother tried teaching her how to read, using secular material. It was impossible. The girl could not read anything. Oliva gave up in despair. She threw the book across the room and told little Rose to get out of her sight. Then her grandmother began to teach Rose from her prayer book. Sometime later, little Rose came out of her room with the prayer book, having read several pages from it. When Oliva asked her daughter who taught her to read and write, she replied, “I asked the Baby Jesus to teach me, Mama, to save you the work and He did.” Rather than being elated that her daughter could read and write, Oliva punished Rose for what she considered defiance. Rose took her punishment without a word of complaint. In an effort to establish a truce with her own mother, Oliva allowed Rose’s grandmother, Isabel, to bring Rose to confession to whatever church she desired. When Rose became five years old, Isabel brought her to the Jesuit church. Rose immediately asked her new confessor if she could make a vow of Chastity. The priest was somewhat surprised, especially in view of the fact that she was only five years old, but after prayer and counsel with superiors, he allowed her to make the vow. It would be a problem for Rose in later years, when her mother wanted her to marry, but at this time, it seemed harmless to the priest, and to our little Saint, it was an important gift to give Our Lord Jesus. Through a controversy which took place between the government and the Archbishop of Lima, the Lord moved Rose and her family from the Jesuit church to the church of St. Dominic, to which Rose became extremely attached. There was a special statue in this chapel of Our Lady of the Rosary. Many of the faithful of Lima flocked in time of need to petition favors of Our Lady. In this chapel, Rose had many encounters with the Mother of God, some of them actual apparitions, others inner locutions. Down through the centuries a strain of Catholicism ran all through the Indian religious beliefs. For example, the Incas believed in Heaven, Hell and Purgatory. They had what they called Huacas, Holy Things. They believed in the Resurrection; they fasted; there was a sense of sin; they believed in confession and penance. But after the great evangelist left, they lost the values of the teachings. The Cross on the hill remained, but nobody knew why it was there or what the Cross meant. They lost the sense of what suffering and adversity meant. They believed, much like the Biblical Job, that suffering and adversity, misfortune of any kind, were punishments from the good God for sins committed. This was the spiritual society into which Rose Flores was born on her mother’s side. Her father was a Spanish soldier. Gaspar Flores was born in 1531, (the year that Our Lady came to Tepeyac Hill in Mexico) while his parents were en-route to Puerto Rico from Spain. It is believed Gaspar was possibly born on a ship, or right after the family arrived in Puerto Rico. From his earliest days, his life was filled with stories of conquistadors and battles between the Spaniards and the Incas. He grew up with a thirst for combat. At fifteen, he left Puerto Rico and went to Panama to take part in the battle on the side of the Spanish conquistadors. He had been very involved in most of the wars in Central and South America for Spain, either against the natives, or the British, or the French. From as far back as he could remember, there was always a war or the intrigue of a war, or the spoils of a war going on somewhere in his world. Gaspar spent his life in the military until there were no more battles to be fought, or until he was judged too old to take part in them. He finally settled in Peru after having traveled and lived in most of the New World of the time. He met a beautiful girl, Oliva, who was sixteen when he was forty five. She was completely feminine, with none of what we would consider the special spiritual qualities necessary to be the mother of a Saint, much less a mystic like St. Rose of Lima. She was completely wrapped up in the social life of Lima of the Sixteenth century. She also possessed the exact qualities Gaspar Flores wanted. He fell in love with her and asked for her hand in marriage. He was considered a great catch to Oliva’s family, despite the age difference. Planning their married life became Oliva’s entire life. She fantasized how it would be. While Gaspar, her betrothed, was not rich, he held a noble position. Oliva envisioned them as becoming a part of the social gentility of Lima. That called for a special house in a great neighborhood with all the trappings of middle-class Lima. One day, while they were house-hunting, they came across a little parcel of land owned by the Church of St. Dominic. Oliva fell in love with some rose bushes in the back of the property. Gaspar told her that if they bought this land for their home, the rose bushes would be part of their property. She became ecstatic. He further told her that the roses were from the first seeds planted in Peru. She went out of control, as any sixteen year old girl would. The decision was made on the spot; they had to have that property for their house. Through a controversy which took place between the government and the Archbishop of Lima, the Lord moved Rose and her family from the Jesuit church to the church of St. Dominic, to which Rose became extremely attached. There was a special statue in this chapel of Our Lady of the Rosary. Many of the faithful of Lima flocked in time of need to petition favors of Our Lady. In this chapel, Rose had many encounters with the Mother of God, some of them actual apparitions, others inner locutions, and still others just down-home conversations with Our Lady. At this particular time Rose was only six years old, but a thought pattern was established which would stay with the Saint all her life. Peru was in danger of revolution and civil war. All the people were praying for peace and an end to the crisis. Rose began, at this very early age, to pray for the people of the city, the people of the country, and for the officials of the government and the Church. Rose would offer this form of prayer for the rest of her life. You are currently browsing the archives for the St. Rose of Lima category.